Archives : NIFTY HEADED FOR 6900 - 14/03/2014. NIFTY HEADED FOR 6900 – 14/03/2014. Market took some time off this week for consolidation as can be seen by this week’s price movement. This consolidation will hold the market in good stead as the Bulls have taken a breather before they can resume the assault on the Bears. Nifty is headed towards an intermediate target of 6886-6897 with resistance expected at around 6700. Traders should keep in mind that since this is a strong breakout, any dips or declines will provide a buying opportunity for the Bulls as it will not reverse the uptrend. Sensex opened the week at 21819, made a high of 22023, low of 21573 and closed the week at 21809. Thus it registered a small weekly loss of 110 points. At the same time the Nifty opened the week at 6491, made a high of 6562, low of 6432 and closed the week at 6504. Thus the Nifty closed the week with a loss of 22 points. On the daily charts, both Sensex and Nifty have formed a big white body candle on Friday. On the weekly charts, Sensex has formed a Doji formation whereas the Nifty has formed a small white body Spinning Top. Combined with previous week’s formation, Nifty has formed a Bearish Harami Cross which is a Bearish Reversal pattern. This pattern requires confirmation in the form of a real black body candle formation in the next week. Hence next weeks candle holds great significance for the market as it will determine whether the short term uptrend continues or not. Last week the market has left behind a Bullish upward gap (Sensex 21539-21525 and Nifty 6413-6403). This Bullish Gap is acting as a strong support which got validated this week when the Sensex reversed from a low of 21573 and Nifty from 6432. Also the Bullish Gap mentioned above is also a Measuring Gap and as per Gap theory the target falls at Sensex 23101 and Nifty 6886. There is a strong confluence zone between Sensex 22294-22302 and Nifty 6695-6712 which is likely to act as strong Resistance Zone in the near term. This week, both Sensex and Nifty managed to remain above the short term average of 20dma (Sensex – 21163 and Nifty – 6294), the medium term average of 50dma (Sensex – 20912 and Nifty – 6216) and the long term average of 200dma (Sensex – 20163 and Nifty – 6003). Thus the trend in the short term, the medium term and the long term timeframe remains bullish. MACD and ROC are both positive and continue with its Buy signal. RSI (68) suggests strong bullish momentum. MFI (64) has reduced from being overbought but still suggests positive money inflow. Stochastic Oscillator is in Sell as %K (87) is below %D. ADX (32) has increased, suggesting that the uptrend is very strong. The Directional Indicators are in a Buy mode as +DI continues to remain above -DI. OBV continues in Buy mode making higher top higher bottom formation. Both the indices continue with Buy signal on Bollinger Band. Thus Oscillators suggests a bullish bias in the near term. The Nifty O.I. PCR is at a strong level of 1.43 which suggests bullishness prevailing in the market. For the March series, highest Open interest build up is seen at 6400 Put and 6600 Call. This suggests that the market expects a trading range with support coming in at 6400 levels and resistance around 6600 levels. 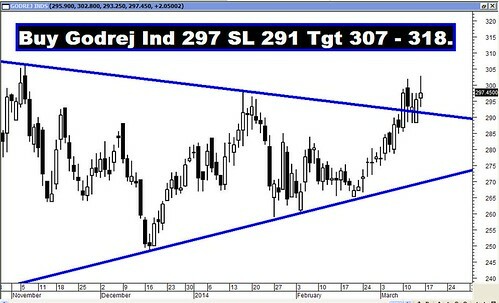 The Trendline Resistance for the Sensex is at 22224. Trendline Support is at 21326. The Trendline Resistance for the Nifty is at 6690. Trendline Support is at 6349. All the Recommendations given in the previous week did well and reached their targets with the exception of Century Textiles. But the Star performer of the week was LIC Housing which went up by more than 8%!! !